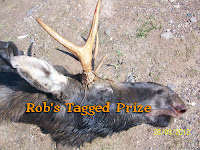 Hello there, VivBounty here to share the exciting story of our friend Rob's moose hunt. The last time Rob shot a moose was 40 years ago. 1972 was a big year for him and Angie. First they bought a 200 acre farm, then he shot a moose and to put the icing on the cake, their daughter was born. That year Rob called his childhood friend Roger to help him drag the moose out of the woods. To obtain his coveted moose-hunting license this year was literally the luck of the draw for Rob. Over the years since he shot his first moose, his name has been "in the hat" so to speak from time to time with about 60,000 other hopefuls. Imagine the excitement when he knew this year he was awarded one! For each license awarded 2 shooters are permitted to hunt for the moose, commonly referred to as the 1st gun and the 2nd gun. Rob chose his friend Ronnie, a born woodsman around these parts as his second gun. It is only fitting that his boyhood friend, Roger was invited to go along just as an unarmed observer. Rob's injured knee played a big part in the hunt this year. Ronnie must be given much credit for his preparations going into the woods days ahead for several runs on the ATV to find a trail with a good line of sight, scouting for moose tracks to decide on the best place to build a blind on the ground where Rob could perch safely and comfortably to take aim and from which Roger could observe. 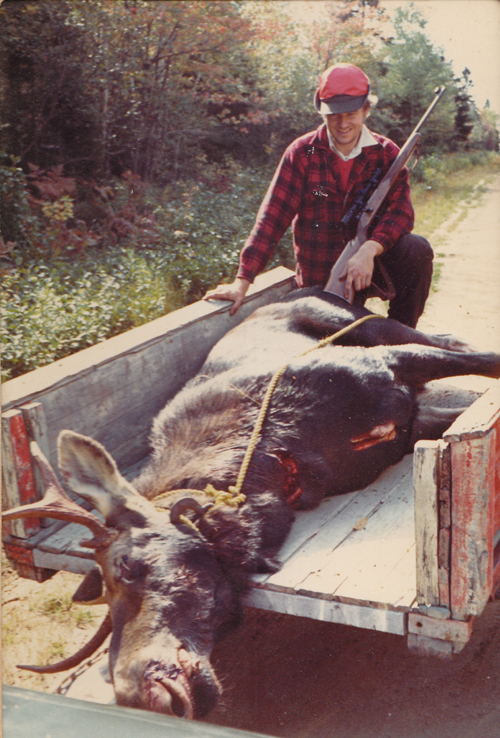 To say New Brunswickers are passionate about moose hunting is an understatement and Ronnie's own childhood friend, Donny, although not part of the actual hunt, helped him to scout and build the blind for the comfort and safety of all concerned. On the day of the hunt the drive-bys and preparation had not been in vain as Ronnie went walk about to circle the area hopefully getting a moose to walk out into Rob's line of sight on the logging trail. 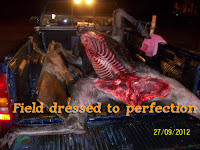 This is not an exact science, the general consensus being if you see a moose and you are licensed, you best take your shot or you may not see it again during your 3-day permit and fines are steep not only for shooting a moose out of season, but also for keeping moose meat in your freezer without a permit. Well Ronnie's preparation and instincts paid off, the moose appeared and he took his shot. Now the moose had to be field dressed in the woods. This involves removing the organs which can get quite messy if you don't know what you are doing. Depending on the ethnicity of the hunter, the liver and heart may be kept for later consumption. The next thing was to drag the moose with the ATV from the mile or so into the woods out to the main road where Rob's truck was parked. He says, "Real men manhandle the moose onto the truck but why work hard when you can work smart?" 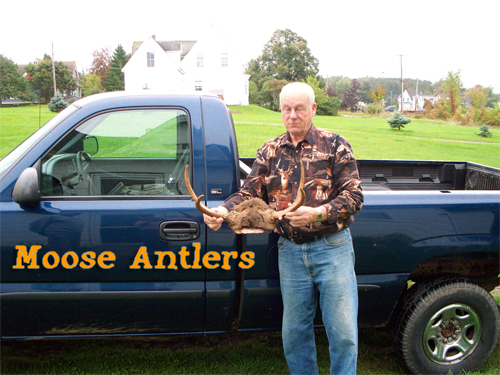 One of the few hunters in the area with a winch on his truck, they hoisted the moose up onto the bed of the pick up. That evening Angie looked at her watch about 9:30 thinking to herself "It's kinda late to be out in the woods." Dare she hope they got one? Well indeed they had! The proud and exhilarated hunters returned with their prize moose all shiny and white inside on the bed of the pick up truck. Angie took these wonderful pictures and the moose was carefully placed where it could cool naturally without the worry of spoiling until it could be examined by the biologist the morning. It is against the law to skin the moose before the biologist has examined it. Fortunately weather conditions were ideal with our local temperature being only 3°C overnight. The next morning the biologist removed a tooth from the lower jaw which indicated the age of the moose to be about 2 years and a male, commonly called a bull. Rob's guestimation by the size of his prize moose was that he was too small to have been born in the spring 2 years ago but larger than if he was born this past spring, making him approximately 16 months old, young enough to yield approximately 485 lbs of tender, less gamy, more beefy tasting meat for the consumption of 2 very happy families. There is much cause for celebration in Rob's, Ronnie's and Roger's households this year on this momentously rare occasion. I'm so grateful to Angie for sharing your great pictures with me for this blog as I'm sure are your children who were unborn the last time their dad got a moose. Congratulations to Rob on getting the license, Ronnie for being chosen as the 2nd gun and shooting the moose and Roger for being the fortunate witness to only the 2nd time in 40 years his friend got a moose. Until next time, be sure to subscribe to this blog feed for more lovely stories about the joy of country living.